The conference poster was selected in a competition announced by our local newspaper, the Schwäbisches Tagblatt. The poster prize is a small telescope that was donated by Baader Planetarium. The winner is Frank-Michael Urban. Frank-Michael Urban: My intention to make this picture was based on the information that I had. 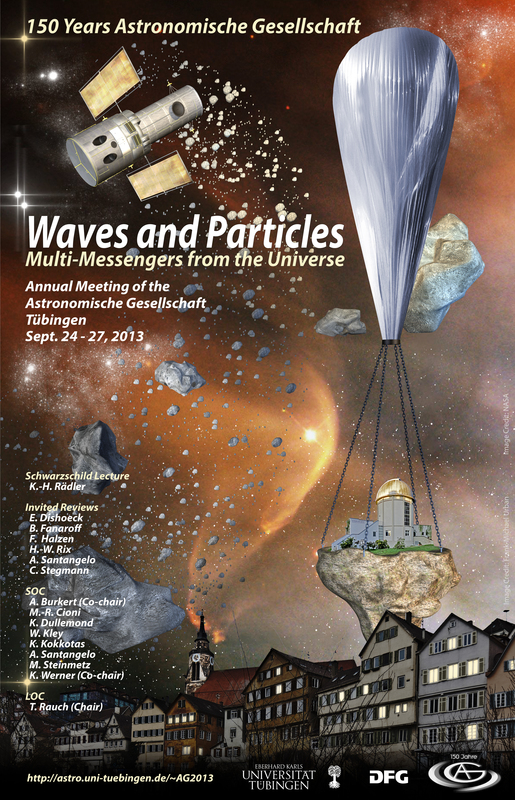 This were the title "waves and particles", the organizer "Astronomisches Institut Tübingen (AIT)", the occasion "150 years of Astronomische Gesellschaft", and the place "Tübingen". Messengers from the universe are difficult to merge in one picture. So I took the bow shock near LL Ori to symbolize the waves, as visible light that we can see and a bow of "particles". For sure, a little bit too big, but so you can see them too. The whole picture symbolizes the logo from the AIT. A satellite, the Hubble Space Telescope, that took the picture of the background. A balloon, which stands for the diverse measurements of the astronomical institute from Tübingen. In front is the skyline of Tübingen close to the river Neckar. All together of course, is a little bit creative art.